S&S Stables has joined with The Girl Scouts of America to support their equestrian program. Horseback riding, horse education and horse wellness are covered. We have programs for Brownies through Ambassadors. 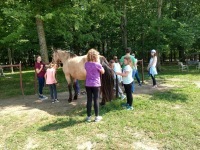 For Brownies through Ambassadors we offer guided horseback riding. It is $45 per girl for an hour of horseback riding. 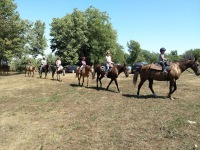 They will ride along the public trails of Hillsdale Lake and get much more than the arena experience. Be on the lookout for lots of wildlife! We take a maximum of 10 people per ride. So, if you have a large group, we will break it up into multiple ride groups. We offer free camping to troops who partake in horseback riding. If you don’t want to camp for the night, we still offer a campsite and free firewood for the girls to use while waiting for it to be their turn to ride. We have restroom and shower facilities available along with water and electric if they decide to camp. We also offer the course requirements for equestrian badges, there is an additional $10 fee.